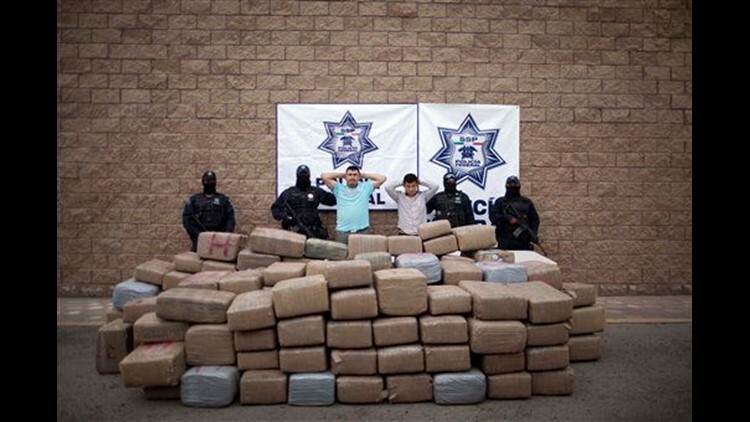 MEXICO CITY (AP) — The U.S. has sent helicopters, x-ray vans and sniffer dogs to help Mexico tackle drug cartels, but Mexican leaders meeting Tuesday with a team of U.S. Cabinet secretaries say that to really help, the Americans must tackle their problem of drug consumption. Both presidents Barack Obama and Felipe Calderon have repeatedly stressed that theirs is a "cooperative effort" to disrupt Mexico's powerful drug cartels, whose power struggles with each other and authorities have led to the killings of 17,900 people since Calderon took office in late 2006. U.S. officials see a strategic problem with their neighbor's surging violence and unstable judicial and law enforcement systems. Mexican officials blame that instability on the insatiable U.S. demand for lucrative and illegal narcotics. As part of the solution, the U.S. promised $1.3 billion in aid under the Merida Initiative in 2008. But with just $128 million delivered, a team of U.S. Cabinet secretaries and other top advisers planned to meet with Mexican counterparts to discuss ways to refocus some of that spending in more effective ways. The full day of U.S.-Mexico talks gained gravity after an American consulate worker, her husband and the husband of a Mexican employee were gunned down two weeks ago in Ciudad Juarez, across the border from El Paso, Texas. Suspected drug gangsters chased down and opened fire on two SUVs carrying the families from a children's party, killing the adults and wounding two children. The sessions in Mexico City were planned months ago and will be led by Secretary of State Hillary Rodham Clinton. "The tragic events in Juarez are just a reminder of the challenges that both countries face," U.S. Assistant Secretary of State Arturo Valenzuela said during a press briefing in advance of the talks. He said that while the situation in Juarez — the murder capital of Mexico with 2,600 cartel-related killings last year — is very serious, "Juarez is not the only place where there is a serious problem. There's a problem throughout the northern part of Mexico and through the border areas." Monday afternoon, in advance of the talks, Obama spoke with Calderon, reiterating his pledge to work with Mexico against narcotraffickers, according to at White House statement. Clinton, Defense Secretary Robert Gates, Homeland Security Secretary Janet Napolitano, National Intelligence Director Dennis Blair and the chairman of the Joint Chiefs of Staff, Adm. Mike Mullen, will have four major objectives, including the push to improve law enforcement, Valenzuela said. Topics of discussion with their Mexican counterparts will include how to disrupt drug trafficking organizations and include communities on both sides of the border in security planning. One item not up for discussion, said Mexico's ambassador to the United States, is the sensitive notion of using U.S. law enforcement agents in Mexico. "There is no intention to authorize U.S. military deployment in Mexico," Ambassador Arturo Sarukhan told reporters Monday, "neither in operational tasks or in intelligence work or intelligence gathering." Beto O'Rourke, who sits on El Paso's city council, was not optimistic that the talks could reduce the spate of grisly slayings in Juarez, one of its sister cities. "Secretary Clinton's visit will do nothing to fundamentally change the long-term outlook for our region's peace and prosperity if she does not tackle the politically difficult issues of consumption and prohibition in the U.S.," he said. David Shirk, director of the University of San Diego's Transborder Institute, said the U.S. needs to fund programs and projects well beyond the equipment and law enforcement training paid for under the Merida Initiative. "The U.S. aid budget for Mexico is embarrassingly low, particularly compared to other countries in the region," said Shirk. "We have to begin moving more resources toward institution-building and comprehensive development strategies for Mexico." Observers expect the meetings will produce a new joint approach on tackling organized crime. "A future strategy will have to look at effective ways to track criminal organizations and their finances, reduce the demand for narcotics and build dialogue with communities that are under stress from the current violence," said Andrew Selee, director of the Woodrow Wilson Center's Mexico Institute. Following the March 13 attacks that killed the three with ties to the Juarez consulate, U.S. authorities launched an offensive against a border gang suspected in the slayings. On Monday, El Paso officials announced that "Operation Knock Down" had led to 25 arrests, including 10 confirmed members of the Barrio Azteca gang.